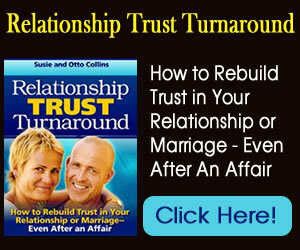 At this point, you should have some fairly solid ideas about how you can become transparent and rebuild the trust in your relationship. 2. Angry Outbursts. Anger is a feeling. At some time, each of us gets angry. It’s what you do with your anger that can harm your relationship. The caution here is that even when you are angry, be respectful and reassure your partner that you are just angry, not dismissing or un-loving them. 3. Unfair Accusations. You will get nowhere by accusing your partner of not caring about you, having never loved you, going out with their paramour when they are five minutes late from work, trying to take revenge on you, or intentionally trying to hurt you. Accusation is not a good way to rebuild your relationship. It makes your partner defensive, and a combination of accusation and defensiveness generally just leads to useless arguments. 4. Constant Fighting. If you are constantly bickering with your partner at this point in the program, you need to review the 2-stage method for conversation that I presented in Section 6. In it you will find ways to be an active listener. If you cannot effectively do this exercise, then you might want to seek professional counseling. Fighting all the time is akin to being angry all the time. It simply doesn’t work to create a healthy and loving atmosphere in which a relationship can flourish in. 5. Taking Revenge. Revenge in any form is a mistake. You certainly don’t want to take revenge and have an affair yourself. Nor do you want to get involved in any other kind of revenge. We have already discussed that issue. Even small ways of being vengeful, like snapping at your partner when they say something you don’t like, biting sarcasm, or saying passive, hurtful things to or about them, should be avoided. If you feel the desire to be vengeful, go back to Section 1 and look at your feelings more closely. 6. Disrespectful or Demeaning Comments. These don’t serve any kind of healthy relationship, and you should particularly avoid them if you are recovering from an affair. There is always a cleaner, more direct way to communicate your needs than being demeaning. Some people, for example, combine their own frustration with a simple request such as, “Will you open the door for me, please.” The combination of the frustration (whether it is related to the request) and the request make the person sound angry. If they are frequently frustrated or overwhelmed, they might come across as always being angry or always talking with an angry voice to their partner. Situations like this are not demeaning by intent, but that is the unintentional impact. 7. Nagging. You certainly will have to make requests of each other from time to time, and you might have to do so multiple times in a day. Asking once or twice about something is okay. Once you go beyond that, you will probably be accused of nagging. If a responsible adult needs more than a few reminders, then some other issue is at work. This is when you need a conversation about the request and whatever issue might be present around that request. Think of times when your partner has nagged you; what issue was going on for you that kept it going? Now think of a time when you nagged your partner. Make a guess about what issue was going on for them that kept it going. 8. Intentionally Engaging in Irritating Habits. If you intentionally annoy your partner by engaging in habits that you know irritate them, then you are not doing all you can to rebuild the trust in your relationship. Cease the behavior, and look at what lies beneath your desire to irritate. 10. Dishonesty. I left this for the end of the list because if there is one of the 10 destructive habits that I want you to remember to avoid, it’s this one. The only thing dishonesty can achieve is a breakdown in trust. It serves nothing else. Don’t get confused into thinking that dishonesty will make your life easier later or that you are somehow protecting your autonomy by lying. It won’t, and you aren’t. Dishonesty only serves to further hamper your progress toward a more beautiful relationship. If you employ the other strategies in this chapter and avoid these 10 destructive habits, your relationship will warm up again and you will learn to trust your partner.